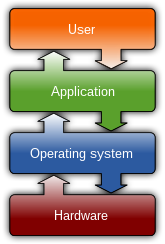 In system programming, an interrupt is a signal to the processor emitted by hardware or software indicating an event that needs immediate attention. An interrupt alerts the processor to a high-priority condition requiring the interruption of the current code the processor is executing. The processor responds by suspending its current activities, saving its state, and executing a function called an interrupt handler (or an interrupt service routine, ISR) to deal with the event. This interruption is temporary, and, after the interrupt handler finishes, the processor resumes normal activities. There are two types of interrupts: hardware interrupts and software interrupts (softirqs). The UNIVAC 1103 computer is generally credited with the earliest use of interrupts in 1953. Earlier, on the UNIVAC I (1951) "Arithmetic overflow either triggered the execution a two-instruction fix-up routine at address 0, or, at the programmer's option, caused the computer to stop." The IBM 650 (1954) incorporated the first occurrence of interrupt masking. The National Bureau of Standards DYSEAC (1954) was the first to use interrupts for I/O. The IBM 704 was the first to use interrupts for debugging, with a "transfer trap", which could invoke a special routine when a branch instruction was encountered.The MIT Lincoln Laboratory TX-2 system (1957) was the first to provide multiple levels of priority interrupts. Edge-triggered interrupts do not suffer the problems that level-triggered interrupts have with sharing. Service of a low-priority device can be postponed arbitrarily, and interrupts will continue to be received from the high-priority devices that are being serviced. If there is a device that the CPU does not know how to service, it may cause a spurious interrupt, or even periodic spurious interrupts, but it does not interfere with the interrupt signalling of the other devices. However, it is fairly easy for an edge-triggered interrupt to be missed - for example, if interrupts have to be masked for a period - and unless there is some type of hardware latch that records the event it is impossible to recover. Such problems caused many "lockups" in early computer hardware because the processor did not know it was expected to do something. More modern hardware often has one or more interrupt status registers that latch the interrupt requests; well-written edge-driven interrupt software often checks such registers to ensure events are not missed. Multiple devices sharing an interrupt line (of any triggering style) all act as spurious interrupt sources with respect to each other. With many devices on one line, the workload in servicing interrupts grows in proportion to the square of the number of devices. It is therefore preferred to spread devices evenly across the available interrupt lines. Shortage of interrupt lines is a problem in older system designs where the interrupt lines are distinct physical conductors. Message-signalled interrupts, where the interrupt line is virtual, are favored in new system architectures (such as PCI Express) and relieve this problem to a considerable extent. ^ Jonathan Corbet; Alessandro Rubini; Greg Kroah-Hartman (2005). "Linux Device Drivers, Third Edition, Chapter 10. Interrupt Handling" (PDF). O'Reilly Media. p. 269. Retrieved December 25, 2014. Then it's just a matter of cleaning up, running software interrupts, and getting back to regular work. The "regular work" may well have changed as a result of an interrupt (the handler could wake_up a process, for example), so the last thing that happens on return from an interrupt is a possible rescheduling of the processor. ^ Rosenthal, Scott (May 1995). "Basics of Interrupts". Archived from the original on 2016-04-26. Retrieved 2010-11-11. ^ Codd, Edgar F. "Multiprogramming". Advances in Computers. 3: 82. ^ Bell, C. Gordon; Newell, Allen (1971). Computer structures: readings and examples. McGraw-Hill. p. 46. ISBN 9780070043572. Retrieved Feb 18, 2019. ^ Smotherman, Mark. "Interrupts". Retrieved Feb 18, 2019. ^ "Eliminating receive livelock in an interrupt-driven kernel". doi:10.1145/263326.263335. Retrieved 2010-11-11. ^ a b Tom Herbert; Willem de Bruijn (May 9, 2014). "Documentation/networking/scaling.txt". Linux kernel documentation. kernel.org. Retrieved November 16, 2014. ^ Jonathan Corbet (November 17, 2009). "Receive packet steering". LWN.net. Retrieved November 16, 2014. ^ Jake Edge (April 7, 2010). "Receive flow steering". LWN.net. Retrieved November 16, 2014. ^ Thusoo, Shalesh; et al. "Patent US 5632028 A". Google Patents. Retrieved Aug 13, 2017. ^ Altera Corporation (2009). Nios II Processor Reference (PDF). p. 4. Retrieved Aug 13, 2017.